You may have heard, BIG things are coming for Metro Vancouver transit as part of Phase Two of the Mayors’ Council 10-Year Vision! In fact, there are so many big things coming that over the next week and a half, we’ll be breaking down the nitty gritty of what’s to come in our new series: 10-Year Vision Spotlight. Have your say! Public engagement on the Phase Two of the 10-Year Vision is open from April 30 to May 11. Public engagement begins today for the investment plan to fund Phase Two of the 10-Year Vision! This is your opportunity to comment on the spending priorities and the sources of revenue for the program. You can learn more and provide feedback online at tenyearvision.translink.ca until May 11 or attend any of the eight pop-up open houses (see below for schedule) being held around the region. Today marks another big day for transit in Metro Vancouver as the Mayors’ Council and the Province of British Columbia have agreed on a funding plan for Phase Two of the 10-Year Vision. This announcement marks one of the largest infrastructure investments in Metro Vancouver’s history! Today is a historic day as pen was set to paper in a deal that will improve transit in our region! A $93 million order for 28 new SkyTrain Mark III cars from Bombardier Transportation was made by TransLink and the provincial government. 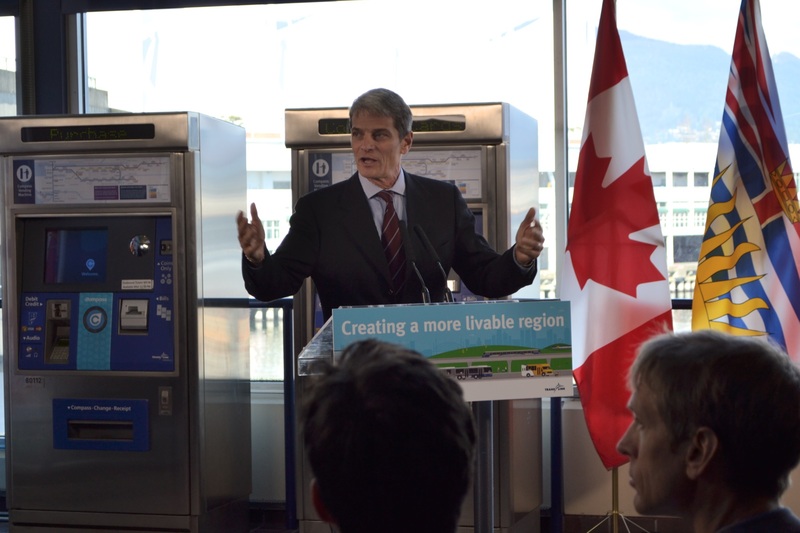 This is part of the $2 billion Phase One of the 10-year vision that is funded 50 per cent by the federal government, 33 per cent by the province and the rest from our region and TransLink. The new SkyTrain cars will provide additional service and capacity on the Expo and Millennium Lines increasing the rapid transit fleet to 314 cars. With these new cars coming into service, more people will be able to rely on public transit, helping to reduce road congestion, greenhouse gases and improve efficient movement of people and goods across the region. The new train cars are scheduled to start arriving in 2018 and after extensive testing, enter into service by early 2019. Starting in January 2017, TransLink will begin service improvements using the existing fleet for the Expo, Millennium and Canada Lines and SeaBus, with additional bus and HandyDart service improvements beginning in April 2017. Want more information on the Mayors’ Council 10-year vision?